Flu viruses can kill people. African swine fever virus can kill pigs. And even the bees can't resist the virus too. In the absence of effective anti-viral countermeasures, the study published in "Scientific Reports" by Washington State University, the US Department of Agriculture's Beltsville Agricultural Research Center, etc., came to the news that "Ganoderma Lucidum helps bee fight virus". It turns out that Ganoderma lucidum does not distinguish between species in its curing function. It can treat both mammals and insects. Bees also eat Ganoderma lucidum? Yes! Bees feed on trees with fungi (mushrooms) such as Reishi Mushroom and absorb the juice of fungal mycelium in wood. This [biological instinct" of the bees has caused curiosity among researchers who have long been concerned about the health of bees – will bees get some therapeutic ingredients? After all, many studies in the past have confirmed that the active ingredients in fungi can exert antibacterial and antiviral effects. Interestingly, the nature of the bee has long been discovered, but it has not been focused by the researchers. Until the past decade, the Colony Collapse Disorder (CCD) spreads around the world, and viral infection is considered to be one of thepossibleculprit. There is always a lack of effective countermeasures to prevent the virus from spreading in the bee colony, which makes the role of fungi such as Ganoderma lucidum on the health of bees become a topic of discussion in the scientific community. After all, more than one-third of the world's fruits, nuts, and vegetables rely on bee pollination to produce fruit. Today, the number of bee colonies in the world has been reduced by more than 30% from a decade ago. The resulting agricultural and food crises are as urgent as the current climate crisis. In October 2018, the University of Washington State University and the US Department of Agriculture's Beltsville Agricultural Research Center jointly published a study in the "Scientific Reports" to confirm that Ganoderma mycelium extracts can be used to feed bees. Such a practice can effectively inhibit the number of viruses in bees in a short time. it is a "practicable" hope for maintaining the health of bees. The two viruses selected for this study were the deformed wing virus (DWV) and the lake sinai virus (LSV). The former is widely found in bees of various ethnic groups. Infected bees not only deform and shrink their wings, but also shorten their life span, reduce food intake, and reduce immunity. The latter mainly parasitize honeybees in Europe and the United States. The more bees in the colony get infected and the more virus the bees carry, the more the number of the colonies will shrink. It is a fact that the number of bees has become less and less in the past 100 years, but it has never disappeared so quickly and so widespread as in the past decade. Viral infection is considered to be one of the main causes of threats to the survival of bees. Bees can be infected with viruses, either from each other during pollination (picking up nectar) (eating the virus left on pollen by the last bee) or from parasites carrying the virus. For the most important western honeybees in Europe and America, Varroa mite is the most important medium for infecting viruses. At least 10 kinds of viruses are currently found on the body of the varroa mite, including DWV and LSV which pose the greatest threat to the health of bees. In the absence of a "direct anti-viral" method, using acaricide became the main solution for the farmers to control the spread of the virus in the bee colony, but the killing effect of the drug seems to be getting weaker, because varroa mites have become resistant to such synthetic chemicals, so how to maintain the number of bee colonies has become the biggest headache for beekeepers. 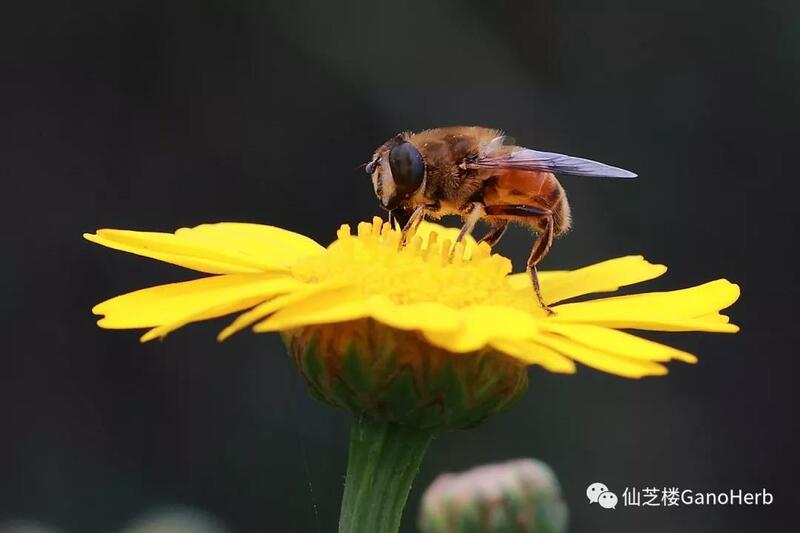 Now, through the above research, as long as a certain dose of Lingzhi mycelium extract is added to the syrup of feeding bees, the amount of virus in the bees can be reduced in a short time, which is an undoubtedly simple, convenient, cost-effective, and feasible approach.